Egg Tempera Painting, Levels 1 and 2, with Jim Clay~ Postponed. We will post a new start date as soon as we can. Egg tempera painting is an ancient painting technique, dating back to the late Roman period (1st. Century B.C. to 4th Century A.D.), and possibly to ancient Egypt. It was then widely used in Europe, during the Middle Ages and the Renaissance, in religious frescoes and murals, as well as easel paintings. This method of painting has been growing in popularity in recent decades, though relatively few artists study this technique. 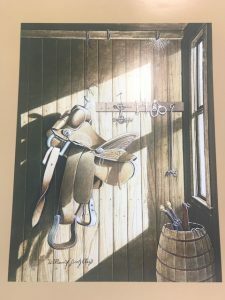 Artist Jim Clay will share his wealth of knowledge in mixing and applying egg tempera, and achieving the light effects, shadows, and vivid colors that can be achieved with this method. Students can bring a photo, or reference material to draw a subject of their choice, whether in realism or abstract. Jim will work with students individually along the way, to help them create a memorable piece to take home. Jim will also teach how to mix and apply “true gesso”, which holds egg tempera much better than the usual acrylic gesso. He recommends students bring a notebook to take notes. $100 for 6 weeks plus $20 supply fee (total of $120). Individual classes can be purchased. All levels, ages 16 to adult are welcome. We will explore something new at each class.